If you’ve ever been on the beach and found yourself starting at the golden sun-lit textures of the sand in awe at nature’s bounty, you can now start getting excited, because it’s coming to a palette near you. 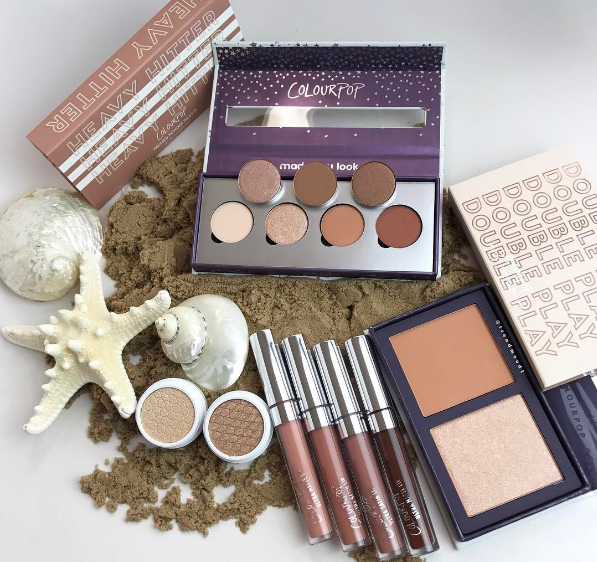 We just saw swatches of ColourPop’s Sand Collection on Instagram, that have us fully ready to infuse our makeup kit with gold and brown tones this spring. If you’re feeling ready to jump into the coordinated arms of the monochromatic makeup trend, ColourPop is here for your needs. The Sand collection is the last installment in a three-part collection featuring shades from the same color family. The first phase was the orange-hued Nectar, followed by an all-pink collection. We have to say, Sand is a pretty glorious finale to this series! The new collection will be available March 23rd, so you can end this week off with a flurry of beachy cosmetics! The collection includes a full eyeshadow palette with seven shades ranging from wine red to a crisp, sandy white. There’s also a blush/highlighter duo called DoublePlay so you can blush and shine, two different single-pressed pearlized eyeshadows, two shades of Ultra Matte lip AND two shades of Ultra Satin lip! Needless to say, if you’re not going broke for the full collection there’s a lot to mix and match! As you can see, swatches of the Topaz palette reveal it to be sufficiently shimmery, while the DoublePlay blush and highlighter duo has an earthy yet ethereal look. We will be religiously refreshing the ColourPop Instagram until Thursday, when the full collection drops!